MyBinding.com has a new product line called foil printed covers. Convey an image of professionalism by adding a foil printed logo on these regency leatherette covers in multiple differenent foil colors and finishes. MyBinding.com offers UV printing on a variety of cover styles. This style of printing is high quality and durable, ensuring your covers look great. MyBinding.com offers a line of covers with windows prepunched on the front. These covers allow your presentation to speak for itself. Windowed covers are available in variety of colors and sizes. Welcome to MyBinding video. 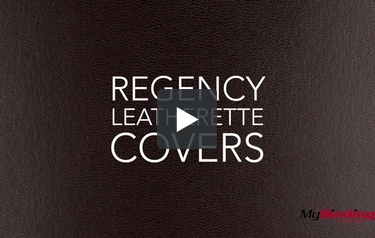 These are Regency Leatherette Covers. They're made to protect your books with a variety of different sizes. The back of the cover has a matte texture while the front has the look of leather. We also have an option to add a custom window, or using gold or silver foil even add your own logo to the front. And be sure to check out the multiple different colors. For more demos, reviews and how-to's, go to MyBinding.com.